Right after the Frame Carry The Athletes have another similar test of speed and strength but this time the weight is up on their back vs holding it in their hands. The implement featured two motorcycles that seemed to be a bit wobbly but it was no issues for the athletes as the times were within 2 seconds of each other for most of the field. Hollands went alone setting the pace at 11.59 Then Oberst went against Savickas with a fast time of 9.79 to beat Savickas in the heat. Nick Best then went against J.F Caron and Best put up a time of 9.21 which would hold on for first place. The exact same time he got in Doncaster last year. 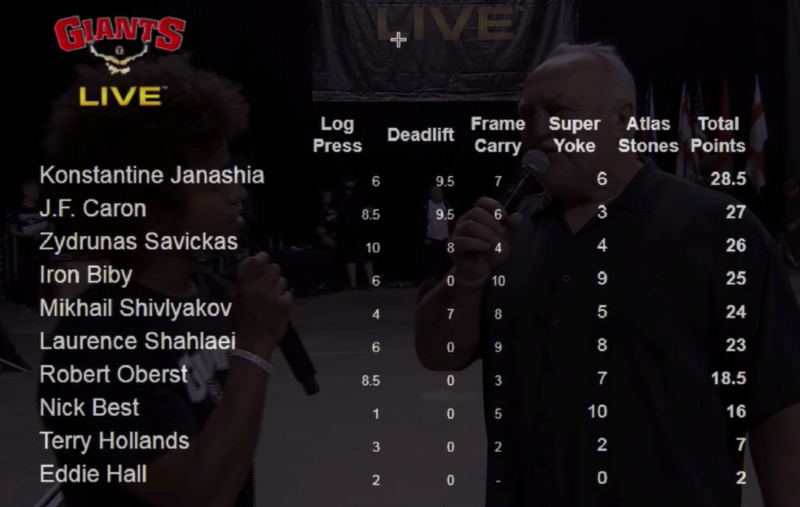 Going into the last event the Atlas Stones the top 6 are separated by just 5.5 points.